Evie's mommy had a little too much fun preparing for Halloween. 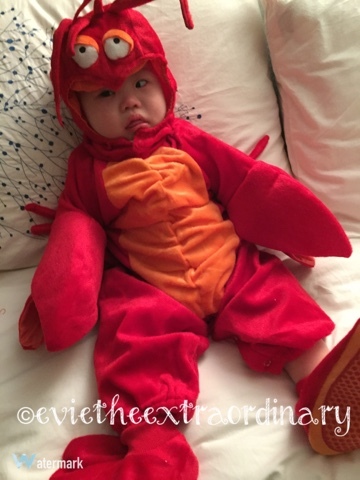 For so long, I've dreamed of having a child of my own to dress up in a cute costume for Halloween. Then Evie came. And I got THREE costumes. This is today's final costume--the one that Evie tolerated most. I think it turned out well, since I like penguins so much. She used to have a long sleeve white shirt that went with the outfit instead of a polka dot shirt, but a poop explosion on a red blanket took care of that, once the blanket went in the wash and turned all of our laundry pink. But I had other aspirations as well. For a cute New England girl, how much did it make sense that she would be a lobster?? But as soon as I put this on, she gave me a look like when will this be over, Mommy. The second I took off the lobster hat, she was all smiles. 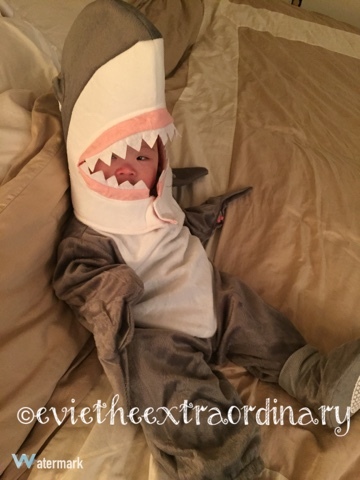 My attempt at brilliance was to make her the dancing left shark from Katy Perry's Super Bowl performance last year. If you don't know what I'm talking about, here is the clip of the dazzling dancing the Sharks did--especially the left one. 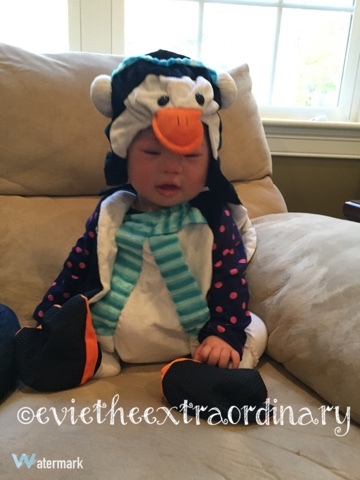 Mommy is done making Evie dress in silly costumes for this year. Until next year, my friends!